The process of Hydroseeding is designed to allow grass seeds and wildflower seeds to germinate in almost any location and play its part in the slope erosion control process. 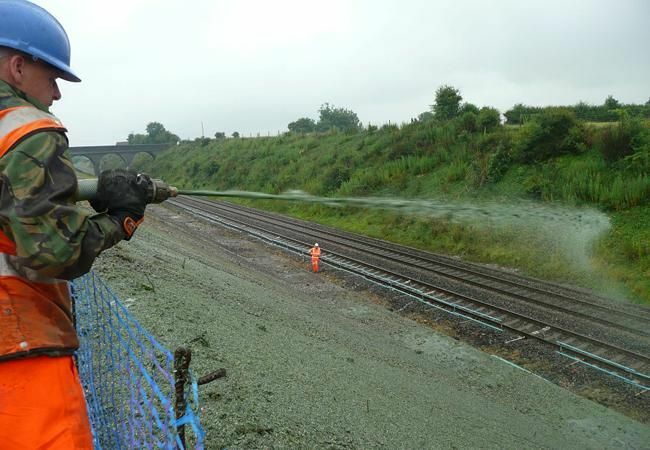 The specified seed mix is applied as part of a Hydroseeding slurry either from the machine mounted nozzle or via a hand held lance some 150m away. This ensures there is limited movement over the area to be seeded and means that the most inaccessible areas still be greened up. This means that grass seeds can be applied where pedestrian access is not possible as in many erosion control projects. Hydroseeding is undertaken using a purpose built trailer mounted machine consisting of a water bowser, an engine, a specially calibrated pump to prevent damage to the grass seeds and materials.This is towed by a 4x4 vehicle. Using specially designed agitation techniques the water, mulch, binders, grass seeds / wildflower seeds and fertilizer are held in suspension.The slurry is then discharged from either a cannon at rear of the machine or from a hand held lance at the end of extension hoses. Projects undertaken by Aquaseeders Ltd are very diverse. They range from applying grass seeds to Landfill sites, wildflower seeds on road verges / embankments to establishing a quality residential lawn. Parks, golf courses, railway embankments ... whatever the situation, Aquaseeders Ltd provide a first rate service. As one of the Uk's leading specialist hydroseeding contractors, our workforce has over 30 years experience in the slope erosion control industry. We work with many members of the construction industry, railway and landfill companies, earth moving contractors, road development schemes, landscape companies and on erosion control projects with the Environment Agency, proving our services can suit a wide number of needs. We offer very competitive rates and can help customers across the nation from our base in Bristol. We are a small company with a high level of customer satisfaction and high product quality, so make sure you come to Aquaseeders for all of your seeding and erosion control needs. As one of the Uk's leading hydroseeding contractors, Aquaseeders Ltd aim to work closely with you to get the right result.